Heat a large saute pan over medium heat, add olive oil, scallions and garlic and sauté about 3 to 4 minutes. Raise the heat to medium-high. Add the cauliflower rice to the saute pan. Cover and cook approximately 5 to 6 minutes, stirring frequently, until the cauliflower is slightly crispy on the outside. Add salt and pepper to taste. Remove from heat and place in a medium bowl; toss with fr. . .
1Heat a large saute pan over medium heat, add olive oil, scallions and garlic and sauté about 3 to 4 minutes. 2Raise the heat to medium-high. 3Add the cauliflower rice to the saute pan. Cover and cook approximately 5 to 6 minutes, stirring frequently, until the cauliflower is slightly crispy on the outside. 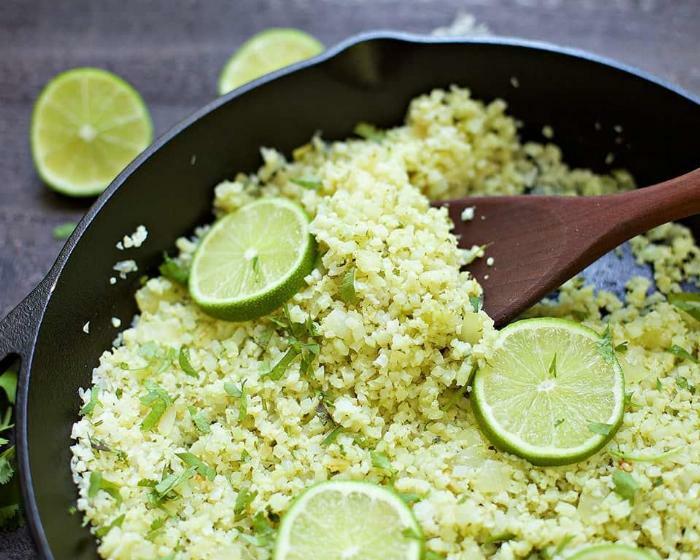 5Remove from heat and place in a medium bowl; toss with fresh cilantro and lime juice to taste.